Rocket League has been one of the few cross-platform games available so far, linking players on PS4, Xbox One, PC and Switch together for intense automobile soccer action. The only problem is friends on different consoles can’t choose to play with each other. That problem is fixed starting on February 19. 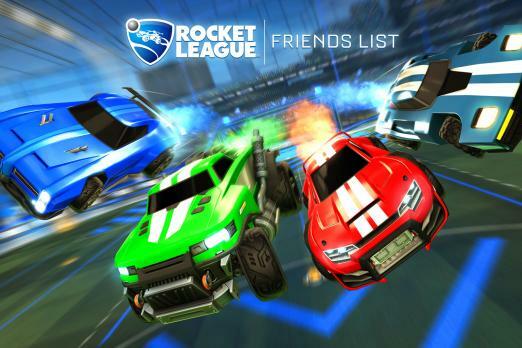 Called Friends Lists, Rocket League will be capable of linking players from every gaming console together on one team. Once the update is released on February 19, players will see a new “Friends List” on the main menu. This menu is split into four tabs. The first tab is “Friends” and shows all your friends on your current platform. The second tab is “RocketID” and shows all your Rocket League friends on other platforms. Your RocketID is your username followed by four randomly assigned numbers. Players can change the word portion of their username at any time, but are stuck with the four assigned numbers. The other two tabs on the Friends List are for Recent Players and Alerts. Recent Players shows who you most recently played with and against. If you find yourself making friends with a randomly matched player, you can quickly send a friend request through this tab. Alerts shows all your interactions including friend requests, party invites and club invites. As part of the Friends List update, Rocket League is making clubs cross-platform enabled as well. This means you can create a Rocket League club with all your friends regardless of what console you all use to play. There are other updates included in the February 19 release as well. Competitive Season 9 rewards will release to those that earned them, and Competitive Season 10 will officially kick off. Extra Modes, including Dropshot, Hoops, Snow Day and Rumble, are coming to Free Play and a new display now shows how many Weekly Wins you need to complete the Weekly Wins challenge. As usual, the update also adds some bug fixes and other minor tweaks. Expect a full list of patch notes for the Rocket League Friends update once the patch is live. That should be around 1 p.m. EST on all platforms. So what do you think? Are you excited to play with your friends on other consoles once the Friends update for Rocket League is released? What other features would you like to see added in a future update? Let us know your thoughts in the comments section below.